Here's my 1950 3600 purchased from Washington 2yr's ago had frame off resto just about finished, now! Thank's for keeping it an 8 lugger!!! Hi Fellas. 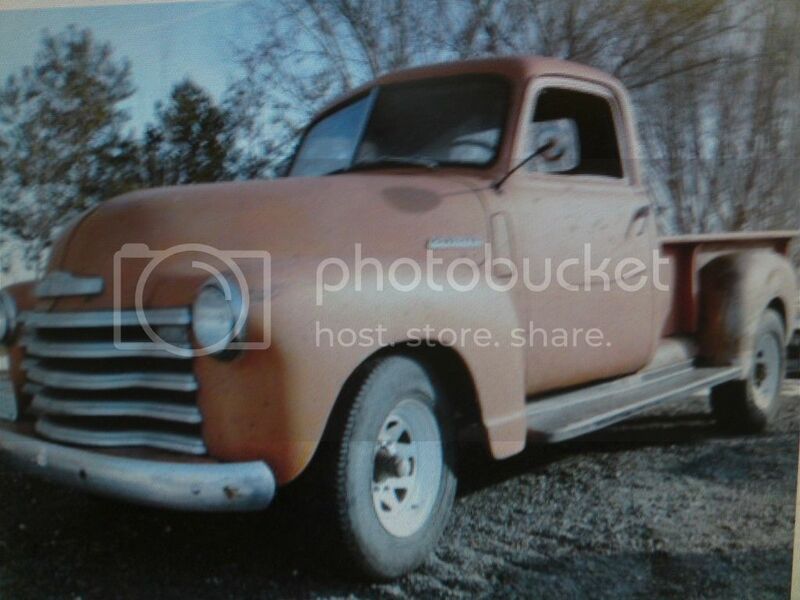 What was the name of the split, front seats in the '47-55 chevy trucks? I think there were no split front-seats on non-Suburban/Panel 47-53 small trucks? There were Unison/Ride-Control "split" seats available as an option on 54/55st standard cab trucks. Or the unison seat as Tim describes, The single seat was described as Ride-Control seat, comes with the companion two-passenger seat. I am not aware of others? You show a rough version of the Unison (Ride-Control) seat assembly that will be in my 1954 "deluxe" pickup. The seat assembly seats three people, with the driver's seater being an air-cushioned "floater". I'm not sure but I think the riser, under the seat, for the unison seat set-up is different than the Full Bench seat riser. The illustration on the left is for COE. The illustration on the right is for standard cab. I'll check the FAM, tomorrow (if my failing memory remembers). I have a set (in my garage) that fits on/in my 1954 3104 that originally had a standard bench seat. Looks like "Floor Pan Assembly Not Serviced"
So there is no way to pull up a part number, in the Master Parts Catalog, for just the COE or the Standard Cab seat riser. But you are correct that the illustration on the left is for COE. Are all the Unison seats the same? There must be different shaped seat risers, one for the COE and one for the Standard Cab. My understanding is all the 1954/55st Unison seats are the same. The regular cab seat riser is prepped/marked for (has the appropriate holes for) the Unison seat. And, the rear of the cab is drilled for the "hangers". Holes have to be drilled in the rear of the seat riser, but the locations were "dimpled" at the factory. There is a little sheet metal trim cover on the left of the seat base. Holes for that are also already in the standard cab seat base. It would be nice for Greg Hill to chime-in on this. Greg has Unison seats in his "regular" cab 1954 pickup, and Greg helped me deal with buying, fitting, and covering/upholstery my seats. These are are rare, but they sure are "cool"/nice. How does the seat float ? Are there springs that keep it suspended above its mounting base?